A security guard hung himself upside-down to rescue a girl that fell into a panda enclosure at Chengdu Research Base of Giant Panda Breeding, on February 9. 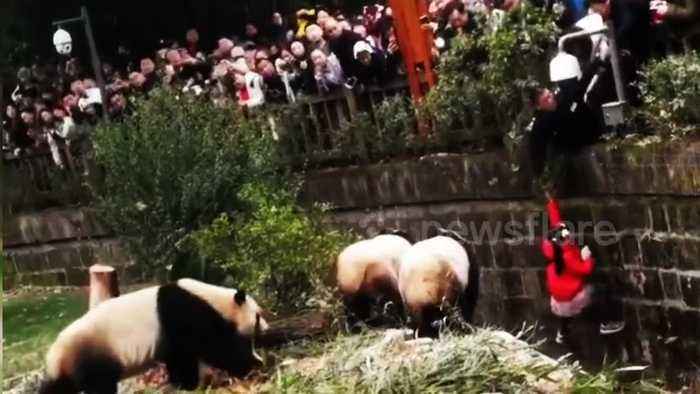 Video of the scene shows a girl squatting beside the wall in a panda enclosure, while a security guard named Liu Guihua attempts to use a bamboo pole to pull her up. The pandas advanced on the girl but the security guard couldn't reach her, so then he can be seen lying down and hanging himself upside-down to grab the girl's hand, despite losing his cap in the process. With the help of other visitors, the girl was pulled out of the enclosure safely. Fortunately, she was confirmed as not suffering any injuries after being checked in hospital. According to reports, the girl fell backwards into the two-metre-deep enclosure accidentally when she sat on the fence.